Northern Bangladesh is known as ancient dwelling. Countless memories of hard earned community's striving and heritage are evident at each and every segment of this ancient habitation. From generation after generation, farmers, earthenware maker, smith, potter, fisherman, local lyricist and ethnic groups are the driving force of this ancient folks. Northern part of Bangladesh is enlightened with the immense contribution of their production, life-style, entertainment and folklore heritage. In a conventional sense, museum is meant for archiving evidence of work and life style of kingdom of different generations and centuries, but heritage built on real life struggle of working segment remains overlooked very often. 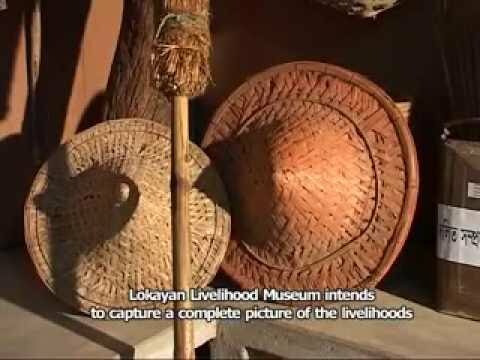 Lokayan Livelihood Museum has been setup through reminiscing ignored heritage built generation after generation challenging traditional outlook of society. The museum established by ESDO is located at Akcha village near by Thakurgoan. Programs Round the Year Bangalees as a Nation are fond of festivals. There has been a saying that in twelve months, there are thirteen festivals in Bangladesh. Lokayan celebrates six festivals in line with six seasons of Bangladesh. Fruits Fest: This festival is arranged in every year in Joisthaya, (June) 2nd month of Bangla calendar. In north western part of Bangladesh fruits like Mango, lychee, jackfruits, Black Berry grow in plenty. These fruits are available in this festival. Barsha Mongol Utshav (During Rainy Season): People of this north western part of Bangladesh have an ingrained association with rains. Rain has been the blessing for our farmers, their life and livelihood. Prayer for rain is there for our existence. Every year in Shrabon (July) this festival is observed with due enthusiasm. Akal Monga: There was a time when this region experienced acute shortage of food during Ashwin and Kartik. With the passage of time, Bangladesh has been able to address the Monga situation with appropriate measures. Poverty has been reduced to a significant level. However, Monga has left a bitter memory for people. Lokayan observes memoirs of Monga on October every year. Nabannaya Utsav: This festival is observed in Agrahayan(November) when farmers harvest new paddy and their home is filled with new hope and joy. This north-western part of Bangladesh is often called ‘the land of paddy, the land of songs’. Farmers celebrate this festival with much enthusiasm and joy. Poush fair and Pitha fest: During winter there has been shivering cold which also creates a platform for Pitha festival. This fest is observed in Poush and Magh (December and January) every year. This fest includes Dhamer Gaan(folk songs), songs of local folk versifiers and such other folk songs. Barsha Baron and Barsha Bidai (New Year celebration and Bidding farewell to Outgoing year): This festival is observed in the last day of Chaitra, last month of Bengali Calendar (30 Chaitra, 13th April) People celebrate the new year with a joyous and happy note. They also bid Farewell to the outgoing year with a sad note. Folk songs are sung and local foods are served among the people during the festival. Bangladesh is a riverine country. Bangladesh, a country of 56000 Square mile, is crisscrossed by many rivers. Some sources mention that in the medieval period there are thirteen hundred rivers in Bangladesh. For the last some hundred years many river have lost their life line due to climate change and geo- political facts. According to Water Development Board there are 230 rivers in Bangladesh. Because of some man made factors like unfavorable attitude towards nature, many rivers have already dried up. People of this country are mostly rivers-centric. But it is an irony that man-made factors are mainly liable for the loss of rivers. The River Gallery was open to the visitors in 2016. An amazing fact is that water of almost all the rivers is preserved here. Many objects of river-centric different occupations are also displayed here. Moreover, this gallery has a rich collection of objects, inventory of rivers, information of boats, boat festivals, bhatiali song and rural folk music composed out of love for river and nature. Information on char, flood, fisheries, birds, are also presented here. Our rivers are our best assets; our best friends too. However, a coordinated effort is required to save these rivers, canals, beels from decay and death. It is we who can make this earth a livable dwelling for all of us. Ethnic Minority people Living in plain Land Bangladesh is a dwelling place of multi ethnic people. This country has a rich cultural heritage along with diversified culture of ethnic minority. This people gallery is dedicated to the ethnic minority of plain land. Lokayan has demonstrated their livelihood, culture, dwelling, dress, food habit, occupations, festivals and other social events. Language: Austro for Santals, has an inclusion of Asian Language. Ethnic Traits: People have medium bodily shape, deep color skin, flat nose, fleshy lips and curly hair. These features have an indication of Austrian ethnic sources: They migrated to India even before the Dravidians from Australia and from the adjoining islands of the Pacific Ocean. Abode: Rooms are small and these are made of earth having no window. Dress: Male wear ‘Dhuti’ but presently they wear Lungi, Dhuti and Gamcha on the other hand Women wear two pieces cloths called ‘Fota’. They also wear Saree and love to adorn their hair with flowers. Foods: Rice is their staple food; their favorite food includes fish, crabs, pigs, birds and animals. Occupation/Profession: Farming and Hunting. Both men and women are engaged in economic activities. Having been deceived by the mainstream people, they have now become landless. For survival they use bows and arrows. Religious Ceremony: Santals and Oraon are mostly converted into Christianity. Some of them worship nature deities. ‘Bonga’ is the God of Santals. Oraon call their Gods as ‘Darmesh’. Fine Arts: They have an ardent interest in Fine Arts. They play on Dotara (two string musical instrument), flute, Dhol, Madol, and these instruments are made from their local objects. They also draw picture on walls using different colors. Festivals: Both Santal and Oraon are very much fond of festivals. Santals celebrate Malmey in Falgun, Bonga-bongi in chaitra Hom in Baisakh, Dibi in Ashwshin and Shorai in Poush. On theother hand, Oraon celebrate Fagua in Falgun, Karam in Bhadra and Poushna in Poush. Agriculture: Plough, Ladder, Spade, Sickle, Winnower, Sieve, weedier, axe, chopper, crowbar, doolie, cooking tools etc; these implements are locally made of stone, wood and iron. Herbal Medicine and Treatment: Mortar and pestle, small pot made of Stone, Amulet (protective metal ring used for protection against Evil), protective garment, spell stick etc. Cultural Instruments: Dhak, Dhol, Flute, Hollow Cylindrical instrument for music beaten with sticks, small Hollow Cylindrical instrument, Drum, Single string and double string music instrument, Mrdanga, Dhak, Sanai, Bansi etc. Coin/Currency: Coins of Sultani period, Moghul Period, British Period, Pakistan Period and Bangladesh Period. Coins and currency of Bangladesh period are also preserved here. Jewelry/Ornaments: Jewelry made of earth, silver, and zinc of different times are also displayed here. Religious Objects: Zaynamaj (Small Mat for prayer), Small stool, Rosary, Auspicious Lamp, Auspicious thread/marriage thread, Heavy knife/ chopper/ Machete with a haft, book and manuscript and so on. Sports/Recreation Materials: Reel, kite, Marbel, a Catapult/toy shooter Y-shaped stick, Top, Carom Radio, Television, Cassette Player, VCR, VCD etc. Abode/Household Objects: Door, window, chest, stool, cot with four legs, wooden/earthen dish, earthen clod, earthen plate, earthen bowl, wooden sandal, oil Lamp, wicker stool etc. Marriage Objects: Marriage costume, Kabin nama (register book), vermilion pot, Poems for marriage, marriage card, trunk, Suitcase etc. Pottery: Earthen Plate, Vessels, Vases, bowls, Jar, and utensils. These pottery objects are made of clay and heat. Document/Letters: Deed, postcard, letters, rent receipts, certificates, patta, Mouza Map etc. Crafts: Nakshi Kantha, wall mat, reticulate bags hanging from wall, objects made of bamboo, wood and jute. As a tribute to the martyrs of independence war ESDO built ‘Aparajeo Ekattor’ in 2012. ESDO also built a sculpture ‘Muktiro Mandiro Sopanotole’ to pay tribute to sacrifices in liberation war. It also renovated the grave of first martyr Mohammad Ali of Thakurgaon, who sacrifice his life for the cause of freedom. Liberation War Gallery at Lokayan Life Diversity Museum has also been created. This Gallery has been divided in different corners named Old Age, Middle Age, 1757-1947, 1947-1971 and exclusively Nine Month of Independence. Memoirs of different wars as well as of liberation war are preserved here with due honor. The main objective of Liberation War Gallery is to present the true/appropriate history of Liberation War through demonstration of liberation war related films and features, audio visual library and building an open stage and a modernized auditorium. Musical Instruments produce melodic sounds and may accompany vocal music. In the Indian subcontinent, archaeological excavations and ancient texts reveal a highly developed musical culture. The use of the banshi or venu, vina and mrdabga was known to the Indus-Valley Civilisation. Apart from the vina, the Vedas refer to other instruments such as the dundubhi and bhumi-dundubhi. ESDO has been continuously working on preserving this immense area of the culture of this region and beyond. The life style, culture, heritage, values, tradition, feeling of people in the long history of this region and beyond have been portrayed and expressed over the years and Lokayan Life Diversity Museum is also made of the collection of more than 1000 musical instrument. In order to reach out to the audience with the history of instruments and help people muster more knowledge, the Musical Instrument Gallary of Lokayan Life Diversity Museum contains instruments like Double Stringed, Sharengy, Shorod Double Stringed, Violin/Fiddle, Monochord, Bengu, Ukulili, Hatbina, Haoiyan Guiter, Bell, Shango, Mondir, Kortal, Cymbal, Ghungur, Cornet Music, Vewgal, Trumpet, Kashi, Mandira, Chlorinate, Flute, Sahnai, Casio, Bin, Joltarango Sekar, Kath Sekar, Frog Sekar, Jhijhi Sekar, Krisno Kathi, Premjuri, Markach, Chati/Chapati, Jipsi, Setar, Tambourine, Tubaphone, Xylophone, Dof, Dugdugi, Khole, Dhol/Drum, Nakara, Baya, Serkach, Kongo, Bongo, Kahin, Harmonium, and Tabor. Language is one of the core components of culture. Language is one of the vital tools that has been leading towards to development of the civilization and human being. It has been contributing to utility through knowledge and experience, awareness, harmony, evaluation of though, culture and most importantly for the progress of human civilization. Indian sub-continent has a rich history of cultural and language diversification and so do Bangladesh. Different parts of Bangladesh have their own tradition and cultural pattern and diversified language is a unique characteristic of this rich culture of Bangladesh. Bangladesh is the only nation in the world where people have struggled and given their lives to have recognition and rights of their mother language. Thus, language is one of the core components of the emotional bonding and heritage of Bangladesh. The evaluation of Bangla language is rich and different parts of the country, as mentioned, have unique and separate language. But with the passes of time, different languages are being extinct and LOKAYAN Life Diversity Museum has been working to preserve all language around the globe. Initially, different language of all 64 district of Bangladesh have been preserved both in written forms and recorded version. 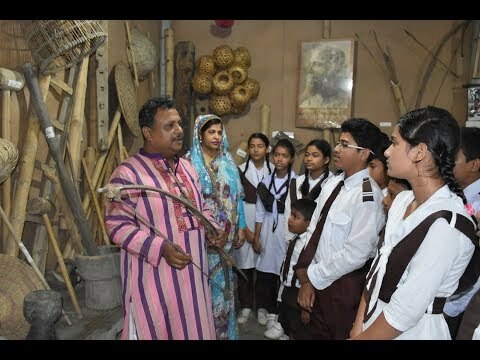 Visitors of the museum get to know the rich heritage of Bangla language every day. The collection of the different language of different parts of the world is under progress and soon be assembled for the demonstration for the visitors.